A hunter-gatherer who trekked through a desert oasis a hundred centuries ago left the continent’s most lasting impression: the oldest known human footprints in North America. There are only two of them — one left and one right — but the ancient traveler’s path through mineral-rich sediment in the Chihuahuan Desert allowed them to become enshrined in stone, and now dated, some 10,500 years later. The tracks were first discovered during highway construction in northeastern Mexico, about 300 kilometers from the Texas border, in 1961. They were excavated and taken to a local museum for study, but their precise location was lost to history. A search for the site in 2006 came up empty, but it did turn up an additional 11 tracks in the general area where the original prints were believed to have been found — a marshy, spring-fed desert refuge known as Cuatro Ciénegas. “Both sets of prints are ones that have been identified before and are the only reported footprints in the Cuatro Ciénegas Basin, but neither have previously been dated,” Felstead said in an interview. Felstead and his team were able to date the tracks because they were preserved in travertine, a sedimentary rock that contains minute traces of uranium from the waters in which it formed. Since uranium decays into the element thorium at predictable rates, the scientists were able to measure the ratio of those materials to determine the specimens’ ages. Their results showed that the pair of tracks discovered in 1961, now housed at Saltillo’s Museo del Desierto, were about 10,550 years old. The 11 other prints, which remain where they were found in a Cuatro Ciénegas quarry, dated back about 7,250 years, according to the research. The difference in age suggests that, while both sets of prints were made possible by the basin’s marshy, carbonate-rich sediments, the 11 recently discovered tracks are not from the same precise location as the pair found in the 1960s. 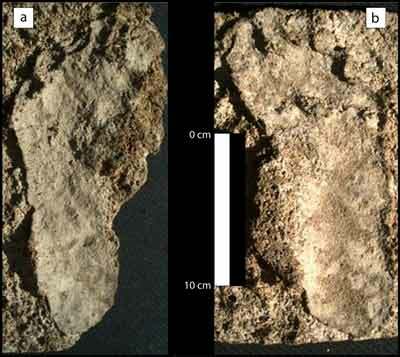 Although rare, other fossil human footprints have been found elsewhere in North America, from Nicaragua to California. 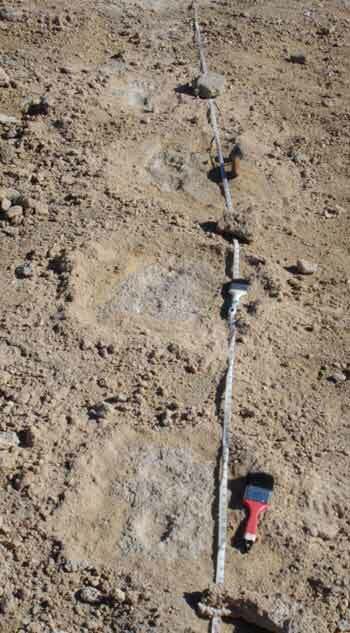 But those tracks are at least a thousand years younger than the newly studied samples, Felstead said. The oldest known human print in the Western Hemisphere is the tiny track of a child’s foot in Chile dated to 13,000 ago — adding fodder to the ongoing debate about when humans first migrated to the New World. Though they may not clarify that controversy, the new findings from Cuatro Ciénegas do provide valuable insights into a time and region of North America that’s not very well understood, Felstead said. While many of these bands are known to have frequented Cuatro Ciénegas over thousands of years, the Coahuiltecans left precious little evidence that could be fixed to specific dates. The oldest previously reported human fossil evidence in the area were coprolites — fossil feces — found in a rockshelter dated to about 9,000 years ago, Felstead said. “So our reported footprint date is not only the oldest human fossil evidence, but also the oldest archaeological evidence, reported from the Cuatro Ciénegas Basin,” he noted. What’s more, his team’s analysis of the 7,200-year-old tracks also turned up traces of ancient pollen from trees like pecan and willow, suggesting that the region was cooler and wetter than it is today. But it also yielded pollen from prickly pear cactus, a staple of the Coahuiltecans in historic times, as recorded by the Spanish when the groups first encountered each other in the 1500s. Taken together, these clues suggest that the person who left the 11 ancient footprints was traveling through a changing landscape — one that was gradually becoming more arid, and more challenging, requiring adaptations that still persist among native people in the Chihuahuan Desert, centuries after the rest of Coahuiltecan culture itself disappeared. Falstead and his colleagues report their findings in the latest issue of the Journal of Archaeological Science. These people are not extinct they are working our fields and living all over mexico and the u..s.
Our lands? Those people? You mean the people who were robbed, enslaved and almost killed off by Europeans. Not excluding the people that Europeans enslaved and brought here . Now we have a mess of racism, insanity and a break down of moral fiber. You can’t imagine how boring you are. Total agreement! My grandfathers lived on the Chesapeake and were among the rarest of all indigenous who actually were respected and became quite wealthy…same time frame as Pocahontas / Rebecca. However, the tribes in the regions were pushed and many were burned alive for land to grow our sacred ceremonial tobacco for profit t these invading Brits. The descendants fought against the Brits in the Revolutionary War, of course, although, I do not see how the newly named “Americans” have ever since taken ethical actions that stem from the inner source of Spirit. The DNA testing from my relatives and others in that region date back to 22,000 yrs or so, with a haplo group that points to some transatlantic crossings (one of which leads to an area of southern Russia). People have been traveling around on the seas from land mass to land mass for much longer than most believe. Evidence abounds. This may seem silly but I’m curious, what size shoe are the footprints? Interesting question! I’m embarrassed to say I didn’t think to ask (though I can if you like). If I’m reading the measure guide in the top photo correctly, the prints look to be about 22-23 cm. So that would be a modern size 6 for men (US), size 4 for women? Small by modern standards, I’d say. They didn’t wear shoes. As you can see from the prints. They may have worn covers in a size untumaca to them. LOL. They may be the oldest known but the odds against them being the oldest approximates certainty. Older walkways could easily show up at any time. As one researcher in Africa recently reported that after seeing some odd squiggles in soil layers and being told they were most likely tracks he and his staff found themselves excavating several layers of tracks by prehumans. I suspect that if someone was willing to do some research they could do the same here though I’m _not_ suggesting humans are that old in North America. On the southern bank of the Ottawa River near Burritt’s Rapids is a single print around size 11. The rock appears to be granite. I saw it 40 years ago. It is very close to a bike/walk path and has surely been seen by thousands of people. What science takes to be remarkable is often quite common. Keep you eyes open and senses tuned. There are amazing things everywhere. Great article! Someone on our facebook asked the following question: Where were the fossil footprints found in California? Do you happen to have any more information that we could pass along to him? A quick search showed some (54) ca 4300 year old prints by adults and children found along the Mojave R. around Victorville, CA, in the late 70’s. Don’t know if these still hold the oldest found in CA. UC-Riverside archeologists found these, so maybe a search at the UC-R website can yield more details. “They became extinct after the arrival of the Europeans.” However, they are probaly still around and may be here after the Euros have died off. I was in the Sonoran desert in 2000 AD and walking bare footed out of the desert came a man dressed only in a loin cloth and with a snake tatoo that would around his body from his foot to the top of his head. A local Mexican resident said the indio was from out of the desert where they live in the old ways. He said they come into town occassionally. At another very small village, I saw a dead bird of prey that had been ceremonianlly placed on the steps of the dilipidated cahtedral. It seemed as if the local shaman was having a spiritual war with the Catholics. Some large and very dark indians silentlystared at me fronm across the dirt plaza. It felt very creepy and so we, the only Euros for miles around, left. They, the indigenous, are not extinct. Where in the Sonoran Desert did these events happen? I am surprised Dr. Murray’s name has not been mentioned. He was a Christian pastor who used to have documentaries on satellite of visiting such sites in North America. Once he documented a dinosaur-like footprint that had a human finger (toe?) under it. I used to put all his documentaries on VHS tape. i think the foot prints are maps that are carved into the rock. I have a problem with dating techniques. I do doubt their accuracy of dating methods. So, climate change is claimed in this article to have changed rapidly and a disadvantage to mankind in those earlier days. There must have been alot of campfires and flatulation to accomplish that, in accordance to Al Gore and follower’s beliefs on man-caused climate change/global warming..
Congratulations, you are the first to put a political spin on an article not about politics. You must be so proud. Please try to get your information from sources outside of Faux News and the DailyMail. I see that socalled “Native Americans” still keep ignoring the “KENNEWICK MAN”, obviously to continue profiting from the falacy called “First Nations”. I do not see the sense in this comment. What do you mean? How can be is this possible, it’s too old.